Not From Concentrate Premium Natural Orange Juices, Grapefruit Juice, Pineapple Orange Juice, Orange Strawberry Banana Juice - and introducing our new, affordable Tree Ripe Organic Apple, Grape and Orange Juices! Only fresh, juicy fruit goes into Tree Ripe Premium Natural Not From Concentrate Juices, so you won’t find a more delicious juice! Tree Ripe Natural, sometime referred to as the Original style, is the best selling, most popular choice among all consumer preferences. The taste and texture of a freshly squeezed orange! 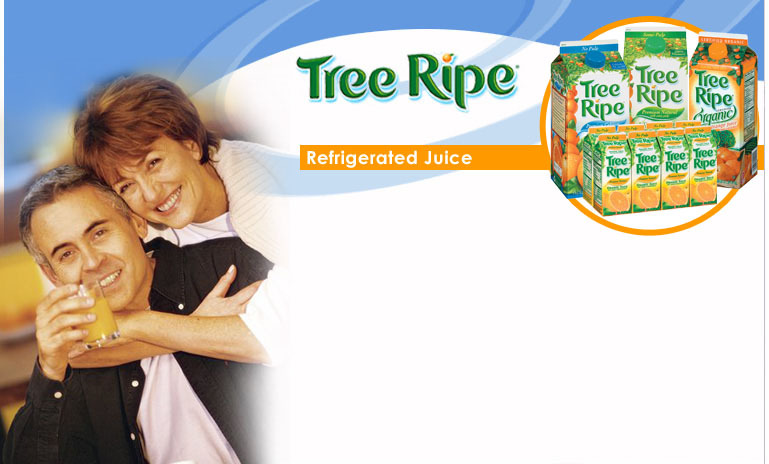 The only not from concentrate juice fortified with calcium and vitamins A, C, D & E! Did you get your recommended daily dose of calcium and vitamins today?! The same delicious, nutritious juice in a convenient size 6oz carton that you can take anywhere. Just grab one and go! Tree Ripe Organic Orange Juice is an excellent source of vitamin C (a powerful antioxidant) and a good source of potassium, folate (folic acid) and thiamine. These nutrients have been shown to help improve cardiovascular health.